Download this policy as pdf file. When submitting data, researchers should assign a quality flag to each data value. Researchers can use any quality flag scheme provided that the scheme is defined in the metadata submitted along with the data. 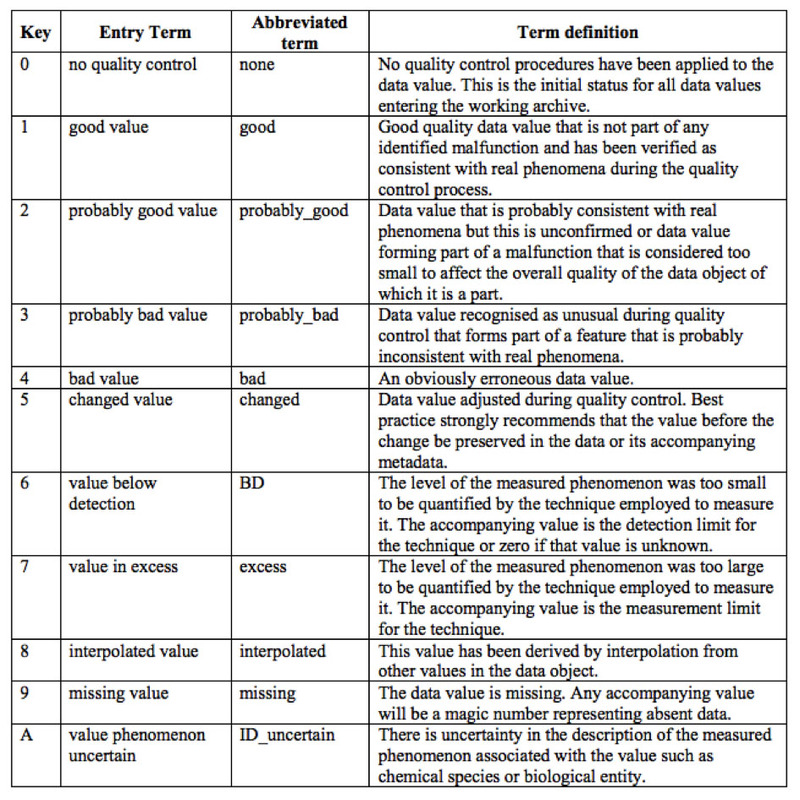 However, GEOTRACES recommends the SeaDataNet Scheme (https://www.seadatanet.org/) which is described in the table below, as it includes a flag for values below detection limits. We anticipate that most data sets would use flag 2 (rather than flag 1) to identify data the analyst believes is accurate. We recommend using flag 6 for values below the detection limit. The method detection limit (MDL) is defined as the concentration of a substance that can be reported to be greater than zero with some specified degree of confidence (usually 95% or 99%). In practice, this is usually calculated using two or three times the standard deviation from multiple analyses (usually at least 7) of a low sample or matrix blank spiked with a low concentration of the analyte of interest. In any case, the method used to determine the detection limit must be defined in the associated metadata. Flag 9 (for missing data) would be used when a sample was simply not collected, or when a sample might have been lost. Once again, the metadata should explain why those data are missing.